Car window tinting laws in Alabama were enacted in 1996. We have provided all the necessary information about your car's window tint, including how dark or reflective the tint is allowed in your state. There are also additional car window tinting rules and regulations in Alabama so make sure you read all about it below. The percent of visible light allowed through your car windows is called VLT: Visible Light Transmission. The percentage of light allowed through your film and glass in Alabama is very specific and different for sedan cars and SUV cars or vans. Front Side windows: Must allow more than 32% of light in. Back Side windows: Must allow more than 32% of light in. Rear Window: Must allow more than 32% of light in. Window tint can reflect incoming light and reduce glare and heat. Alabama window tint law permits a certain window reflection when using a tint so make sure you pay attention to this as well. Front Side windows: Must not be more than 20% reflective. Back Side windows: Must not be more than 20% reflective. Restricted Colors: In Alabama all tint colors are permitted. Certificates: Manufacturers of film need to certify the film they sell in the state. Ask your dealer if they are using ceritified film. Stickers: The sticker/label of compliance to identify legal tinting is required between the film & glass on each tinted window. Medical Exceptions: Alabama permits medical exemptions for special tint. For more details about the specific terms of the exemption, consult AL state law. Penalties: Maximum $100 and/or 10 days in prison for first conviction. Second convicion within a year max $200 and/or 30 days in jail. Third and subsequent offense within a year $500 and/or up to 3 months in prison. 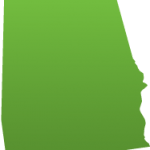 Keep in mind that Alabama tinting laws and regulations may be interpreted differently in your county or place of residence. We always recommend double-checking our information with your local DMV or law enforcement authorities. Our information about window tint laws in Alabama was last updated in 2018 and 2019. Tinting laws in Alabama were enacted in 1996. In case any of our info provided is not up to date or correct be sure to contact us so we can fix it. Thanks! Reach more customers and advertise your services here! We have partnered with JustAnswer to provide you with immediate legal help. Have questions about traffic or tinting laws in Alabama? Ask professional lawyers without having to pay hundreds of $$$ in legal fees just for visiting their office! Traffic law experts are on call 24/7 ready to answer any question you have. Is My Car a Passenger Vehicle or MPV?